Oh yum! A lovely little healthy warming dish on a very, very cold day today. Season the cod loins with salt, pepper & 1 tsp parsley each. Steam cook for 6 minutes in Steam pot or steam oven. Heat 1 tbsp oil in a pan and fry the onion with the garlic for a few minutes, add in the chilli, cumin, cinnamon, turmeric, coriander, 2 tbsp water & tin tomatoes, bring to a boil then reduce and simmer and cover for 20 minutes or until butternut squash has softened. Remove lid and place spinach into pan, do this in 2 batches, it will wilt down in a few seconds, simmer on low for a further 5 minutes. Serve with the steamed cod. Lovely healthy quick mid week meal. Oh I do like a nice piece of fish. I picked up some lovely smoked Cod from my fishmonger and decided to do a tray bake with it. This dish was so delicious and full of flavour. I mixed up the Chimichurri sauce by adding rocket leaves….delicious! Preheat the oven to 180ºC fan. Toss together the potatoes, seasoning and 1 tablespoon of oil in a large roasting tray. Bake for 12 minutes, then add the chorizo, onion and peppers and roast for a further 15 minutes. Meanwhile, prepare the fish. Blitz together the parsley, oregano, bread and remaining oil to form coarse breadcrumbs. Brush the top of the fish fillets with a little extra oil and press on the breadcrumbs. Give the roasting tray a good shake, then place the fish and tomatoes on top and roast for a final 15 minutes, until the fish is cooked. Meanwhile make the chimichurri dressing. Combine all the ingredients in a blender and blitz to combine. Drizzle over the tray bake to serve. 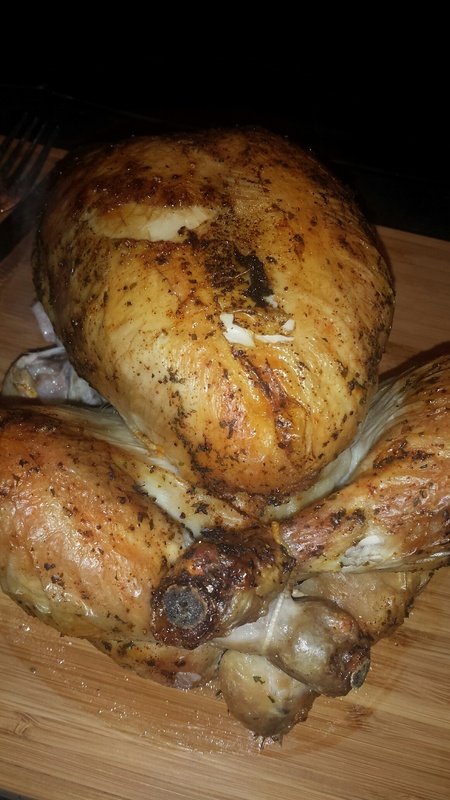 1.5KG Chicken (well oiled with olive oil) – Serves 3-4 people. Cut into wedges 1 onion and 1 wedge of lemon and stuff inside the bird. 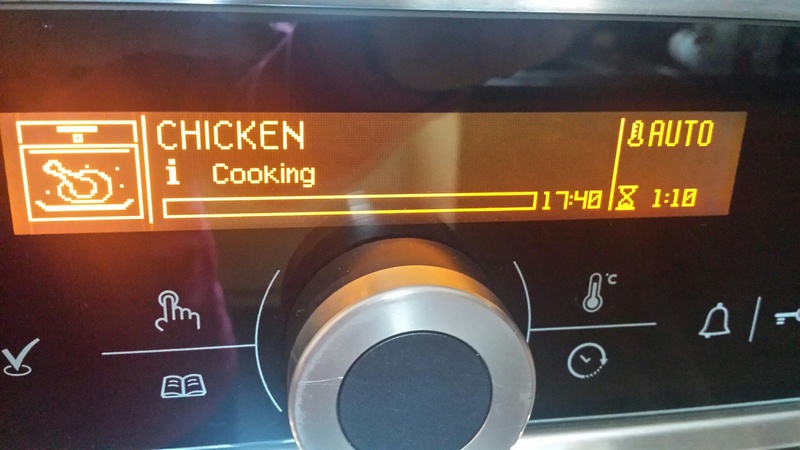 I used my Automatic Cooking programme which works out the temperature and time for you…yes I know…no thinking or calculating, amazing stuff. It comes from the Luce Range by Hotpoint. 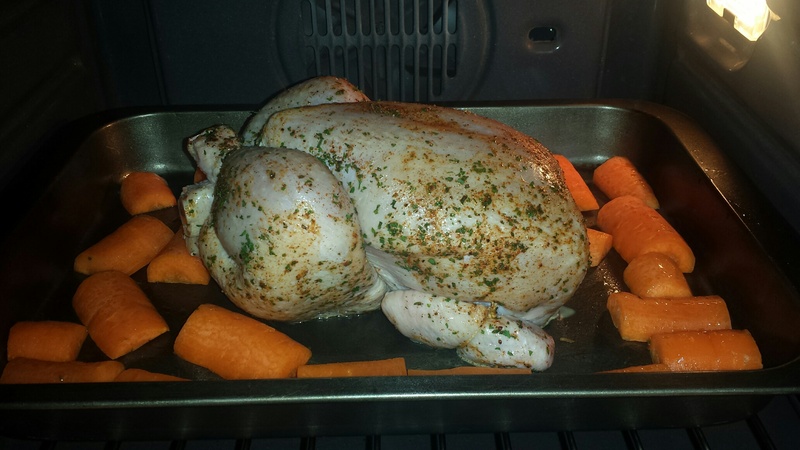 1 hr and 10 mins later I have a perfectly cooked Roast Chicken…Yummy! Got some of my favourite fish from my fishmongers… Jim Mason from St. Monans (small fishing village in Fife), he’s brilliant, always has fresh fish thats caught that morning and delivers to your door the same day…can’t ask for better than that. 1. Spread salmon with cream cheese and lay some spinach on top, the carefully roll salmon into a roll, cut to desired portion size and tie tightly with string to hold each portion together. Put into an oven bag and make a couple of holes in bag, place on oven tray. 2. Place smoked cod into an oven bag sprinkle with little lemon juice, make a couple of holes in bag and place in oven on tray. 3. Bake for approx 20-25 minutes. 4. Meanwhile, place some spinach in a steamer and steam for 3 mins, or place in a casserole dish, add tsp water, cover and cook at 800watt in microwave for 1 minute. 5. Place cod on plate and sprinkle with some parsley and lemon juice, put some light mayo on side to serve. 6. Place salmon onto plate and remove string, splash with lemon juice. 7. 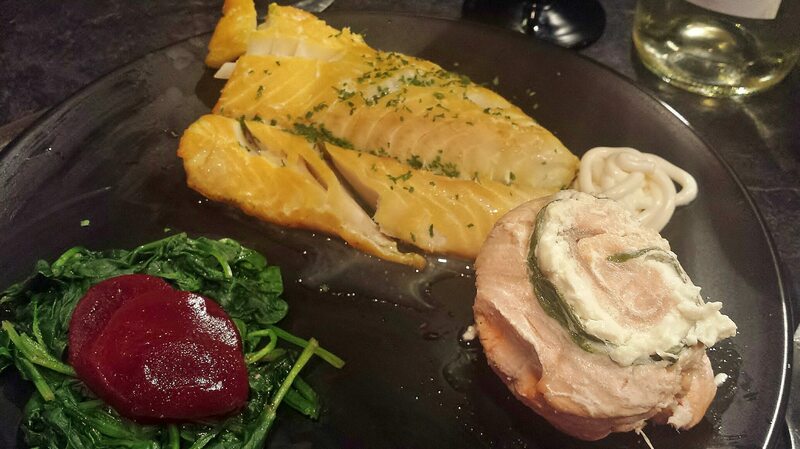 Place steamed spinach on plate and top with some sliced beetroot. 8. Yum…Yum…Yum…..oh! 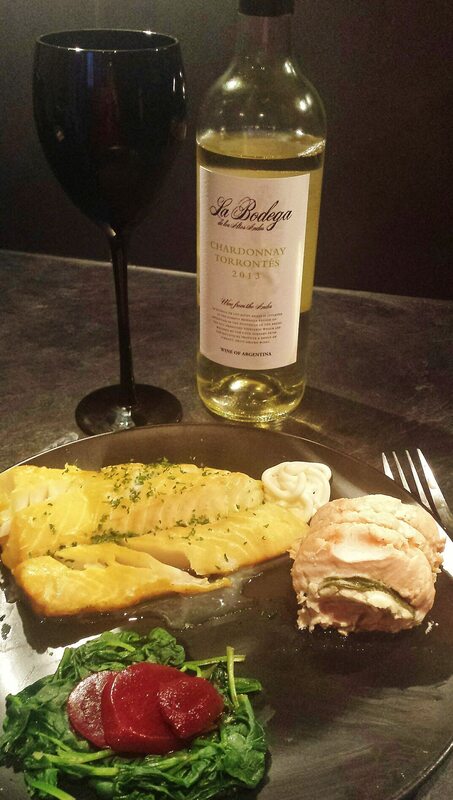 serve with a lovely Chardonnay…..perfect meal!